Craig Mundie is the Chief Research and Strategy Officer at Microsoft Corporation. He gave an interesting talk tonight titled “More Like Us: Computing Transformed” at the University of Melbourne. Mundie discussed natural user interfaces, Avatar Kinect, Surface 2 and telepresence, and I’d like to share my brief notes and thoughts below. Mundie’s most frequently used word was “capability”, which seemed to underline the technology-orientated nature of the talk. He was still talking about “tasks”, “integration” and “automation” … I thought those were the buzzwords of the previous era of computing? “The current web seems like it’s nouns only, we want to add the verbs.” This sounded really interesting but I couldn’t quite grasp the practical meaning. There were several mentions of “computing power”, which in my view is already irrelevant to the larger audience. The new kid on the block is “Natural User Interfaces”. I still don’t like the term – the natural connotation (pun intended) is that some computer interfaces are more natural than others – however it looks like we’re stuck with it. Mundie spent most of his airtime on Avatar Kinect. Having not heard of it before my immediate reaction was “Matrox HeadCasting – 10 years later.” I’m not sure if the human interface problems of those days are fully resolved yet, however the potential reach and audience for Avatar Kinect are huge. The technology is interesting and the live demo was great, but I still can’t see immediate value in telecasting in productivity applications. It’s hard enough to get value-for-time in a live four-way meeting (let alone in one with more people), and the issues are only compounded when the meeting is mediated through technology. Using Kinect as a 3D scanner is way cool. 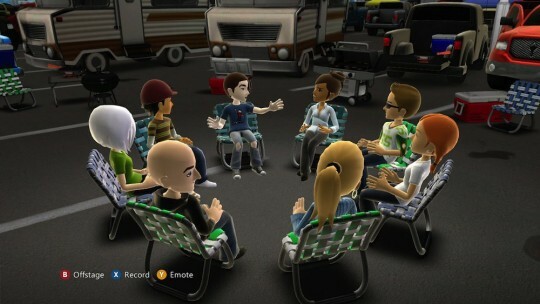 In fact, Mundie seemed to be very much in favour of Kinect Hacks and other similar projects, and suggested that further SDKs will be released within the next few months. Mundie’s suggested continuum of telephone > television > telepresence is interesting. Perhaps telepresence will revolutionise the way we communicate, one day. An interesting detail about Microsoft Surface 2: the “fourth component”, an IR sensor in addition to the standard RGB outputs for each pixels, allows detecting “touch” above the surface. What does this mean in practice? We regain hover! Flash on iPad 3 anyone? There was a great question from the audience comparing the (perceived) ease of gesture-based interfaces to the relatively limited power they (still) have compared to old text-based interfaces. I think Mundie’s answer missed the key point but he did note that “programmers create the framework” [of use] for these new interfaces. I think this risks further division between “consumers” and “producers” in the digital society. Big thanks to Craig Mundie for his thought-provoking talk and for the University of Melbourne for hosting the session!